Is that the U.S. on your touchscreen or are you just happy to see me? 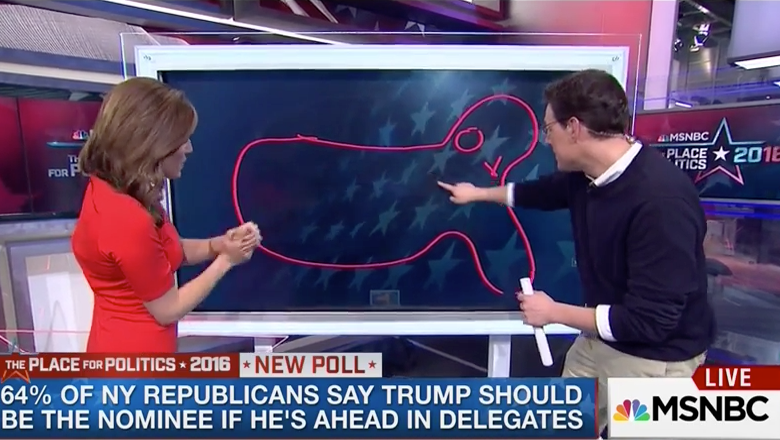 MSNBC political correspondent Steve Kornacki attempted to draw a U.S. map on the network’s touchscreen, but his apparent lack of artistic skills left him blushing. Appearing during the network’s dayside coverage of the presidential primaries, Kornacki quickly drew an outline of the United States in order to prove a point — but it ended up looking more like a blimp, a fish … or perhaps, depending on how dirty your mind is, a part of the male anatomy.